The vigil scene at Iron Crow Theatre’s “The Laramie Project.” Photo by Rob Clatterbuck. Nearly 20 years ago, a 21-year-old gay college student named Matthew Shepard was kidnapped, robbed, beaten, pistol-whipped, tied to a fence and left to die on the outskirts of Laramie, Wyoming. This horrific incident gained international attention and re-ignited the debate over homosexuality, religion, the death penalty, and hatred. Hatred was manifested throughout the ordeal. Fred Phelps, leader of the Westboro (KS) Baptist Church, led protests at Matthew’s funeral that taunted him and his family him and targeted homosexuality. And even more recently, this brand of hatred has reared its ugly head leading up to and following the 2016 presidential election. The murder of Matthew Shepard became one of the most seminal events in the struggle to achieve LGBTQ rights. Indeed, through the tireless efforts of Matthew’s family, particularly his mother Judy and numerous activists, some good came of the heartbreak in that it helped spark the passage of the Matthew Shepard and James Byrd, Jr. Hate Crimes Prevention Act signed by President Obama 11 years after Matthew’s murder. A group of people from the New York City-based Tectonic Theater Project led by its artistic director and playwright Moisés Kaufman traveled to Laramie six times over the course of the year following the murder to conduct a couple of hundred interviews of the town’s residents from all walks of life in an exhausting effort to chronicle the impact the murder had on Laramie as well as themselves as individuals. “The Laramie Project,” as the play is titled, is based on those direct interviews, news footage, court transcripts and other found text. It reminds audiences about the effect hatred can have on everyday people’s lives whether you’re a direct victim or not. It isn’t about being gay or straight; it’s about hate and hate crimes. This affecting play has been performed all over the country. 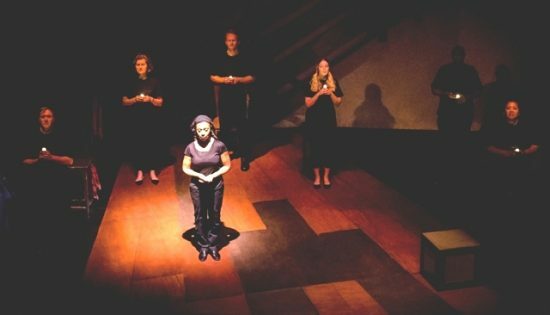 Iron Crow Theatre, Baltimore’s queer non-profit professional theatre company, opens its 2018/19 “Season of Becoming,” by presenting “The Laramie Project” at The Theatre Project. Under the solid direction of John Knapp, the eight-person ensemble cast effectively conveys the wrenching emotion and shock felt by the denizens of Laramie where heretofore the town had hardly ever experienced such a heinous crime not to mention the accompanying onslaught of media attention it garnered. The play requires the actors to perform multiple characters—some even take on cross-gender roles—and in the Iron Crow production they do it effectively. Subtle changes of costumes like slipping on a sweater or taking one off, donning or removing a cap as well as other garments to transition to a different character, the actors seamlessly execute these changes. Three wardrobes on stage provide the stockpile of clothing so that the performers can make these changes while the dialogue unfolds uninterrupted. Each actor effectively adjusts his or her voice inflections, mannerisms and accents to represent a particular person being interviewed as well as being an interviewer. At some point throughout the play, each one has a turn in delivering a powerful soliloquy, showcasing his or her acting skills and versatility. Lighting design by Lily Margola allows a spotlight to shine on the featured actor when speaking on an otherwise dimly lit stage—symbolic of the grim aftermath of the grisly crime. And in true docudrama form, when a person speaks, another cast member identifies the character by name and occupation. Those characters portrayed, such as the young bicyclist who discovered Matthew’s bloodied limp body tied to that fence where he said he resembled a scarecrow; the policewoman who brought him in; the doctor treating Matthew who died in a hospital six days after the attack; the assorted townspeople on both sides of the gay issue; the bartender at the Fireside bar where Matthew was last seen leaving with the murderers; members of the clergy; several lesbians; Fred Phelps; the killers themselves, Russel Henderson and Aaron McKinney; and Matthew’s father Dennis reflected the wide swath of emotions generated by the crime, the ensuing trials, and the aftermath. There are dramatic instances throughout in which ideologies, religious beliefs, stereotypes, cultural attitudes, and humanity converge. Matthew’s actions at the Fireside that fateful night, his discovery at the fence, and the periodic updates on his condition provided by the hospital spokesman are among the highlights. But Dennis Shepard’s passionate statement at sentencing of Aaron McKinney whereby he implored the judge not to hand down the death penalty to the convicted murderer is arguably the play’s most emotional moment. The remaining members of the cast are also excellent, and in no particular order they are: Kecia Campbell, Yvonne Erickson, William Goblirsch, Jr., Warren C. Harris, Lezlie T. Hatcher, Johnna Leary and Nicholas Miles. PJ Carbonell designed the sparse set consisting of the aforementioned wardrobes and several chairs scattered about but the facsimile of a wooden buck fence in the background is a chilling reminder of what this play is all about. Danielle Harrow’s simple but varied costumes depict the realities in the play. Sound designer Sam Lee composed the recorded piano music that serves as an effective background to the dialogue. The composition is available on BandCamp for $1 with the proceeds benefitting the Matthew Shepard Foundation. Iron Crow Theatre’s offering of “The Laramie Project,” ably directed by John Knapp and performed by a talented cast, illustrates the thoughts, fears and hopes of people affected by this unprecedented and historic tragedy. They are just ordinary folks trying to make sense of a gruesome crime that had reluctantly thrust their community into the spotlight. More importantly, it makes people pause to reflect on our society where hate, unfortunately, is not waning. Advisory: The play contains adult situations and profanity and is not suitable for children under age 13. “The Laramie Project” runs through September 23 at the Theatre Project, 45 West Preston Street, Baltimore, MD 21201. For tickets, click here.